So i have been instructing with the Outdoor Skills and Theory (OSAT) course at Lakehead University over the last few fall and winter terms while i have been in Thunder Bay. 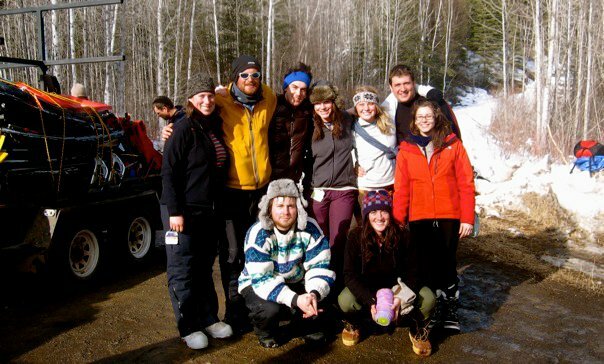 I have led a variety of activities with different students groups from the class including navigation/orienteering skills and backpacking in the fall to nordic skiing, backcountry skiing, and winter camping in the winter. This particular winter skills course went from feb 26th-28th 2010. We snowshoed with packs and pulks of gear into Bentley Lake from the end of Onion Lake Rd about 40min north of Thunder Bay Ontario. The greatest thing about the OSAT students is that they are always excited and enthusiastic and having been through the program before i find it easy to relate to them. 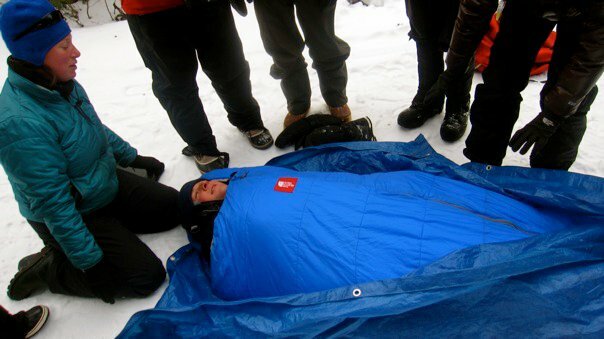 This winter skills course was an introduction to winter camping. 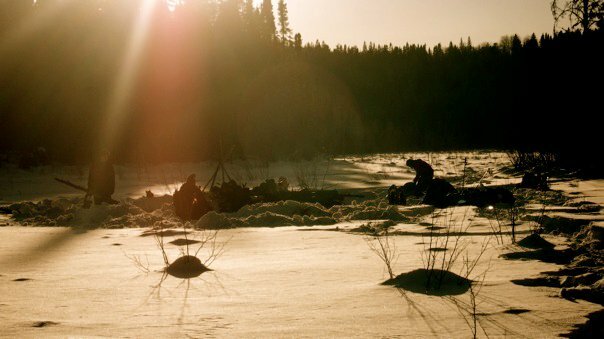 For most of the students it was their first time camping outside in the winter. Luckily we had great weather with beautiful sunny days that were not too cold. The students got to learn and practice their systems for being warm and comfortable in winter conditions, how to set-up an appropriate camp and safetly harvest wood for fires and shelters. This form of camping is quite different from the typical “Leave No Trace” ethics that most outdoor education institutes practice which makes this trip particularly interesting. It really allows the students to have a feeling for what it is like to live off of the land and practice some more traditional methods of camping in combination with the other technological comforts we bring with us. The second day includes a river travel day with a hypothermia first aid scenario. River travel can be potentially very dangerous so for optimum safety we travel in rope teams along ice shelves and across snow bridges, very similar to glacier travel. Students learn about the geomorphology of rivers and how they freeze but can still be crossed safely when ice is carefully probed for the right sound and feel before a judgment call can be made to cross. Students also have to treat a hypothermic victim who falls through the ice. All in all it was a fun filled weekend with a solid crew. 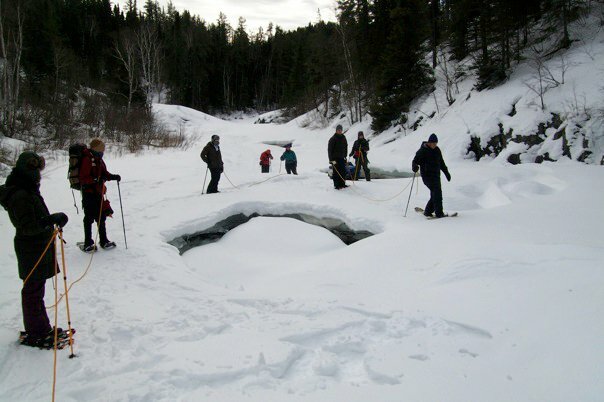 This entry was posted in winter and tagged Lakehead University, Outdoor Recreation, Parks nd Tourism, winter camping by zkruz. Bookmark the permalink.